Last Saturday, I made a presentation to the Association of Lincoln Presenters Convention entitled, “How Abraham Lincoln Used Stories to Touch Hearts, Minds, and Funny Bones,” based on my book. 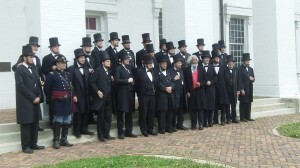 The presentation took place in the Old Vandalia Statehouse, Vandalia, Illinois, (Illinois state motto – Please Don’t Pronounce the “S”) in the chambers where Lincoln actually served as a state representative. 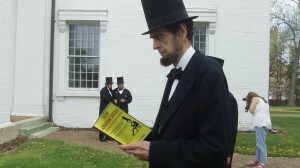 I thought I could feel Lincoln’s spirit in that venerable place. It didn’t hurt that all the Lincoln Presenters were decked out in full Lincoln contume (“with a great beard comes great responsiblity”). They were the most receptive audience I’ve ever had. I felt they all loved Lincoln as much as I did. Lincoln also received his license to practice law in the Vandalia Statehouse in March of 1837. 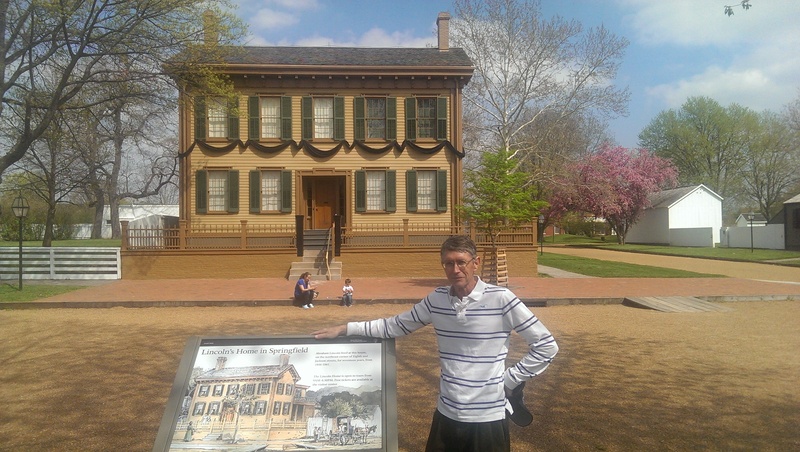 While in Illinois, I availed myself of the opportunity to visit the “sacred” sites where Lincoln lived and worked. 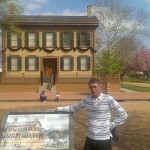 I saw Lincoln’s log cabin in Lerna where I met E,D. Dowling, who worked at the site, and who also was distant relaive of Dennis Hanks, a cousin of Lincoln’s mother. Cemetery, where Lincoln, his wife and three of his four sons are buried. 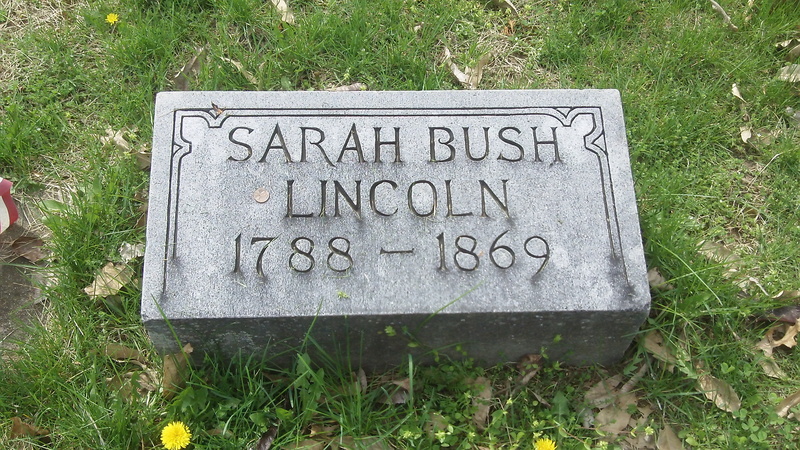 I also visited the cemetery plot of Lincoln’s stepmother, Sarah Bush Lincoln. 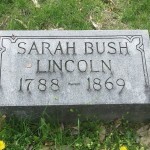 Lincoln had a storng bond with her and before he left Illinois to assume the presidency, he went back to Lerna on a sentimental journey to visit her. One memorable convention activity was cemetery walk tour in the Old Vandalia Cemetery. 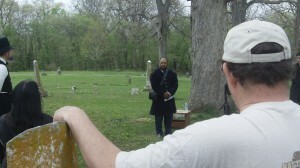 It involved actors portraying the roles of the people buried in the cemetery. It really touched my heart to hear such a vivid presentation of how their lives were changed by the civil war, and the various joys and tragedies they encountered in life. Most moving was a slave who had been given his freedom by a kindly slave owner. After Lincoln delivered the Emancipation Proclamation,the former slave joined the Union army and following the war, led a productive life as a free man in Vandalia. June 5th, 2015. Pascua Yaqui Youth Career Academy. Tucson, AZ. This entry was posted on Wednesday, April 22nd, 2015 at 5:44 pm and is filed under Abraham Lincoln, Storytelling. You can follow any responses to this entry through the RSS 2.0 feed. You can leave a response, or trackback from your own site. Wow great pics and video clips Terry! You sure are the Lincoln expert. I was wandering around SF recently and came across an Abraham Lincoln High School, which was pretty cool. It’s a really large school for being in the city and was founded back in 1940 so the exterior of the buildings are still quite 40’s looking. Pretty cool. Thanks, I have just been looking for info approximately this topic for ages and yours is the best I’ve discovered till now. But, what in regards to the bottom line? Are you sure concerning the supply? You are my intake , I possess few blogs and sometimes run out from to brand.